I have to admit that this was like a red flag to a bull (apologies for the kinda mixed metaphor!). It will be radical and fresh if shaped by the new Corbynite members. It is great news that Carwyn’s stale old blairite, red Tory drivel is being binned at last. Bring it on!! Love the comradely language that Jeremy requests of us. Suppose a real pity we have a Welsh Labour GOVERNMENT. dear me…. ME: I am not on board yet, as I don’t believe a word of the radical and fresh claims. Proof will be in the pudding. Labour’s legacy in government is hardly cause for pride, being the product if years of complacency. Interesting times are upon us. It will be interesting to see if Welsh Labour can rise to the challenge. I sincerely hope so, but I really do think a change of leadership is vital to presentating a fresh, new, radical face with any credibility at all. Reply: We will get out to fight and beat the Welsh Tories. Over and out. ME: Hardly ambitious, let alone fresh and radical. I think I can rest my case too! Reply: Not sure what greater ambition we should have than defeating Tories. They are the enemy after all! ME: Seriously? That says it all and pretty much confirms all my worst fears. So there you have it. Beating the Tories is their sole ambition. No challenge to the charge of complacency. No interest in being fresh or radical so long as the Tories are not in charge. Tory-lite will presumably continue to be acceptable enough and continue to meet Carwyn’s understanding of radical and fresh. No view on whether Carwyn is the right person to take them forward. Of course, I may be proved wrong. The Labour Manifesto for next year’s Assembly elections may well prove ‘fresh and radical’. The influence of the massive influx of new Corbynite members, and the presumably renewed confidence of the long-quiet lefties that always hid away within the party during the Blairite years (with one or two exceptions), will surely have a profound impact if Carwyn is right about policy and the manifesto being ‘shaped by members’. But that is, of course, only half the battle with Carwyn’s administration. They blatantly lie, even in the Senedd itself, and their promises are worthless. One straightforward but huge example emphasises this point – the NHS hospital downgrading. No hospital is under threat, and no hospital was ever under threat in Wales (Labour First Minister, National Assembly, May 1st 2012). And this is not necessarily a complete list, and certainly not the end of the issues with NHS service provision in Wales. So perhaps when Carwyn says he has some radical and fresh ideas lined up, perhaps this simply means he has some actual intention to deliver on his promises. That really would be fresh and radical for him!! P.S. 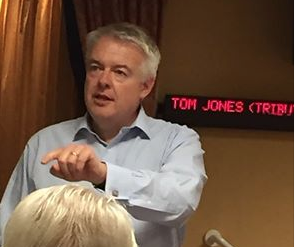 This picture from the Annual Dinner is doing the rounds on Facebook, and is begging for a caption competition re Carwyn Jones as a Tom Jones tribute act! What’s new pussycat? Is it really fresh and radical? Mama told me not to come and get photographed standing in front of that damn sign! This entry was posted in Uncategorized on October 10, 2015 by Bridgend's Green Leftie.